As per Mortgage news daily ..Applications for mortgages increased substantially during the week ended January 11 as purchase applications soared to their highest levels in nearly two years. The Mortgage Bankers Association's (MBA) Market Composite Index for the first full working week of the New Year increased 15.2 percent on a seasonally adjusted basis and 45 percent on an unadjusted basis compared to the holiday shortened week ended January 4. The seasonally adjusted Purchase Index was up 13 percent on a seasonally adjusted basis from the previous week to the highest level since April 2011. The unadjusted index was 47 percent higher than the previous week and 5 percent above that of one year earlier. 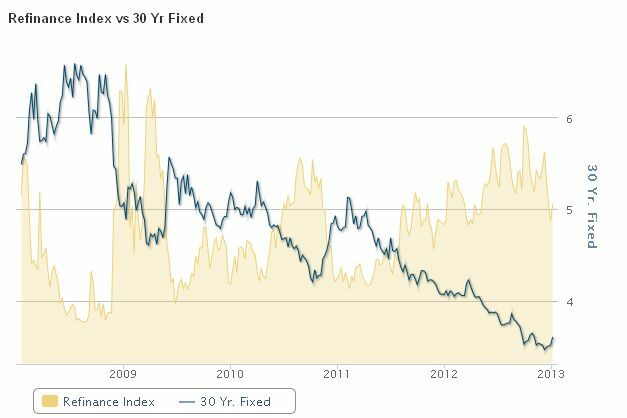 The Refinance Index increased 15 percent from the previous week and the refinance share of mortgage activity remained unchanged at 82 percent of total applications. Interest rates for the week were mixed. The average contract rate for 30-year fixed-rate mortgages (FRM) with conforming balances of $417,500 or less remained unchanged at 3.61 percent with points decreasing to 0.38 from 0.41. The effective loan rate decreased from the previous week. Jumbo 30-year FRM - loans with balances over $417,500 - rose 10 basis points to 3.88 percent with points unchanged at 0.38. The effective rate increased. The average contract rate for 30-year FRM backed by FHA increased to 3.39 percent with 0.58 point from 3.35 percent with 0.69 point and the effective rate increased. 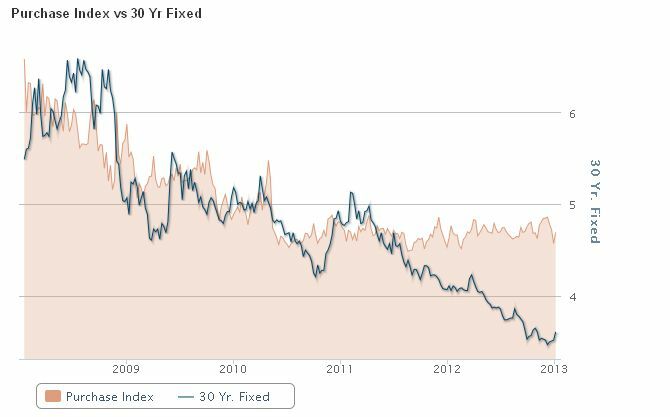 The average contract interest rate for 15-year fixed-rate mortgages remained unchanged at 2.88 percent, with points decreasing to 0.27 from 0.39 and the effective rate decreased. . The average contract interest rate for 5/1 adjustable rate mortgages (ARMs) increased to 2.66 percent from 2.64 percent, with points decreasing to 0.34 from 0.37. The effective rate increased from last week. The ARM share of activity increased to 3 percent of total applications. MBA's Weekly Application Survey covers over 75 percent of all U.S. retail residential mortgage applications, and has been conducted weekly since 1990. Respondents include mortgage bankers, commercial banks and thrifts. Rates are based on loans with an 80 percent loan-to-value ratio and points include the origination fee. Base period and value for all indexes is March 16, 1990=100.